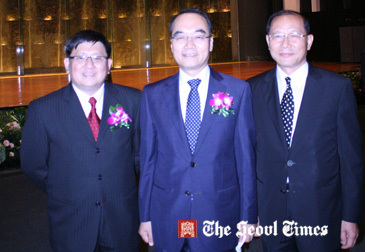 Minister Bahk Jae-Wan (center) of South Korea's Ministry of Stragegy and Finance poses with Singaporean Ambassador to Seoul Peter Tan Hai Chuan (陈海泉). At right is Chairman Chung Sang-Rin of Rose of Sharon Council. The current global economic turbulence offers South Korea another opportunity to test its economic resilience in time of trouble. In 2008 the country’s quick recovery from a global financial crisis and robust reaction to the aftermath of the recent US credit rating downgrade has been extraordinary. Historically, Korea has been termed as an economic and developmental model to many nations owing to the short span of time it overcame poverty and desolation of war to emerge as one of the economic tigers in Asia. But even with such a noteworthy report card, Korea’s real economic strength and potential still remain feebly known to the world. This can be attributed to the fact that Korea has been a closed society for decades compared to such countries as Japan or China. Though there have been significant effort to market Korea to the world market through such committees as the Presidential Council on National Competitiveness and Presidential Council on Nation Branding, more can be done to make Korea more attractive particularly to foreign investors. Korea’s investment policy makers should consider a redesigned dogma from the traditionally highly regulated environment to a foreign friendly platform. This can be done by relaxing key restrictions in the principal factors defining external investment procedures. Of vital necessity, is the revision of regulations and laws related to Foreign Direct Investment (FDI) and labor environment for foreign workforce. With generally stable fundamental economic structures, Korea’s potential to attract more foreign direct investment is substantial. This prospect has been portrayed by a 13.8 percent or $13.07 billion increase in FDI last year constituting the highest level in a decade even amid stagnation in the global FDI flows. Consequently Korea can be an investment destination if it will significantly open up its economy to foreign investment with a goal of modernizing the economy and creating more opportunities for new products and services in the country. To increase cash flow as well as the flow of goods, the Free-Trade Agreements (FTAs) that Korea is currently entering or hopes to ratify, must represents fundamental change in Korea's economic institutions making them inviting to FDIs. To do this however, Korea will have to face some short-term challenges in its domestic industries. Here, the temptation of protectionism must be overcome for the country to emerge as welcoming and buoyant toward foreign investments. This change should also carry the attributes of transparency and efficiency as prerequisites for attracting foreign investors. More so, Korea should amicably address issues surrounding imbalanced business practices and eliminate regulations that are not of the global standards or do not accommodate foreign corporate needs. Specifically, Korea needs to lower corporate taxes and reduce unnecessary administrative restrictions on investment and business operations. The consequence of these radical revisions will not only increase external investments but also raise the country’s annual economic growth to its current 5-percent growth target for the year. Following a strong rebound of key industry sectors like building and construction, and IT after the 2008 financial crisis, Korea economy asserted itself as having a stable and adaptable foundation leading to a positive nod by the IMF. The bank lately upgraded the Korea’s economy based on economic performance and forecast results for the economy. This is undoubtedly a boost to the nation branding effort. Ultimately, the effort for attracting foreign investors must be a joint venture of all of Korean socio-economic-political and environmental aspects. The branding of Korea as an investment hotspot can be built on successes of in hosting such world events as world cup 2002, G-20 in 2011, Daegu IAAF and the upcoming PyeongChang 2018 winter Olympics among others. Welcome to Africa Madam President!